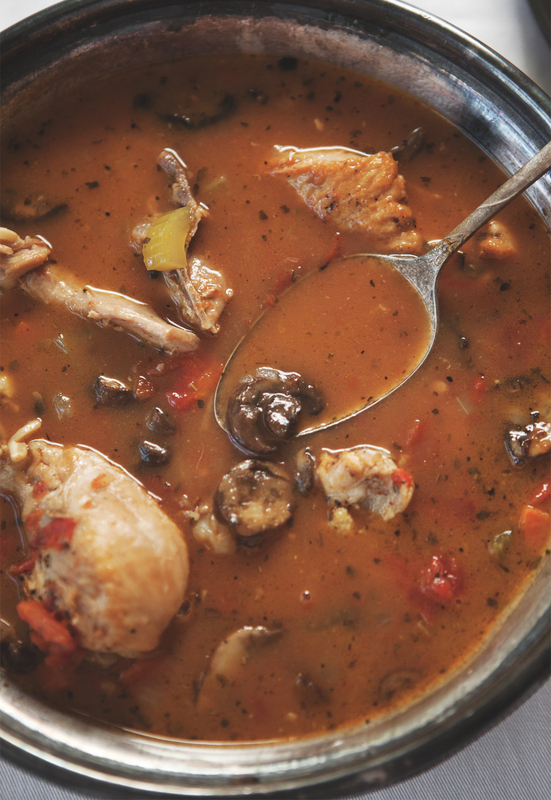 Chicken Chasseur, or Hunter's Chicken Stew as we're calling it could be the perfect fit for the Sunday dinner menu you've been pondering. I read this article recently on Refinery29 about Sunday Supper pushing in on weekend brunch as the new reigning meal. The article is great, but I laughed a little as I read that line. It talks about different Sunday menus and specials at a few Chicago restaurants, and even though we always cook at home for Sunday dinner it made me really happy to see that tradition becoming more commonplace. Since I grew up with a big Sunday family dinner every week, I hadn't ever thought about it as "the next thing in weekend dining" so to speak. I can happily thank my Maltese Great Grandmother for that tradition, it's one that I can say with full certainty I will always maintain throughout my life. Speaking of dinner...this really is a perfect meal as the chilly weather sets in. It's one you'll want to spend some time, and maybe a glass of wine or two with. 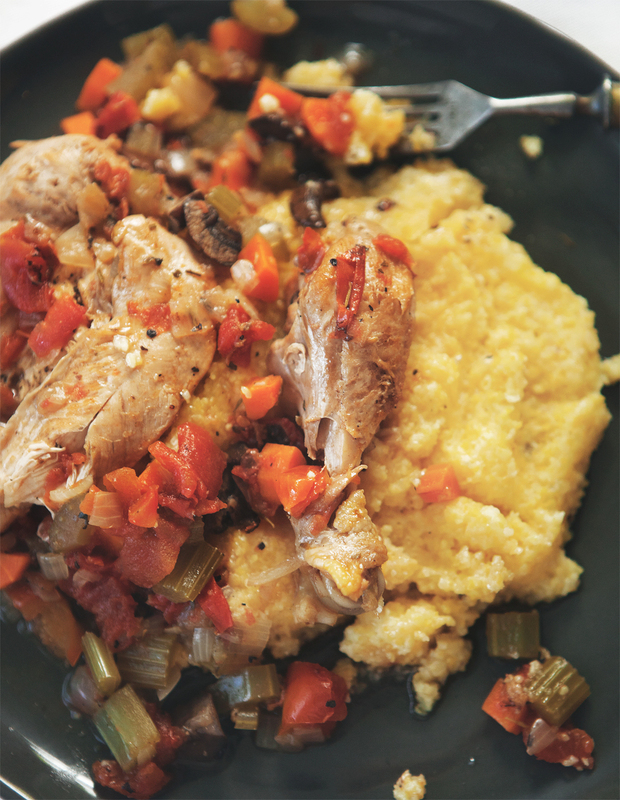 We served it on top of polenta, making it really hearty. If the polenta isn't calling to you, it's just as delicious on its own. Preheat oven to 350°. In a large dutch oven, heat 1 tbs olive oil over medium heat. Working in batches, brown chicken on all sides, about 10 minutes, set aside. Add onion, carrot, celery, and mushrooms and remaining 1 tbs olive oil. Season generously with salt and pepper and sauté until softened, about 5 minutes. Add tomatoes and herbs, cook 3 minutes. Add wine and cook until liquid is reduced by 1/3, approximately 10 minutes. Add chicken stock and chicken. Cover and place in oven. Braise 1 hour or until chicken is tender and falls off bone. While braising, in a medium saucepan bring 6 cups of water to a boil. Gradually whisk in polenta until incorporated. 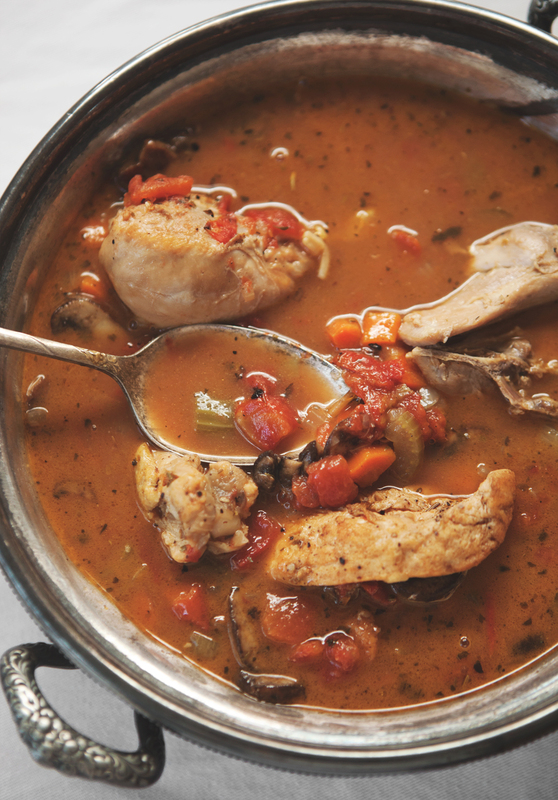 Reduce heat to low and simmer, stirring continuously for about 15 minutes or until polenta has thickened. Add butter and stir to combine. Remove from heat and cover. 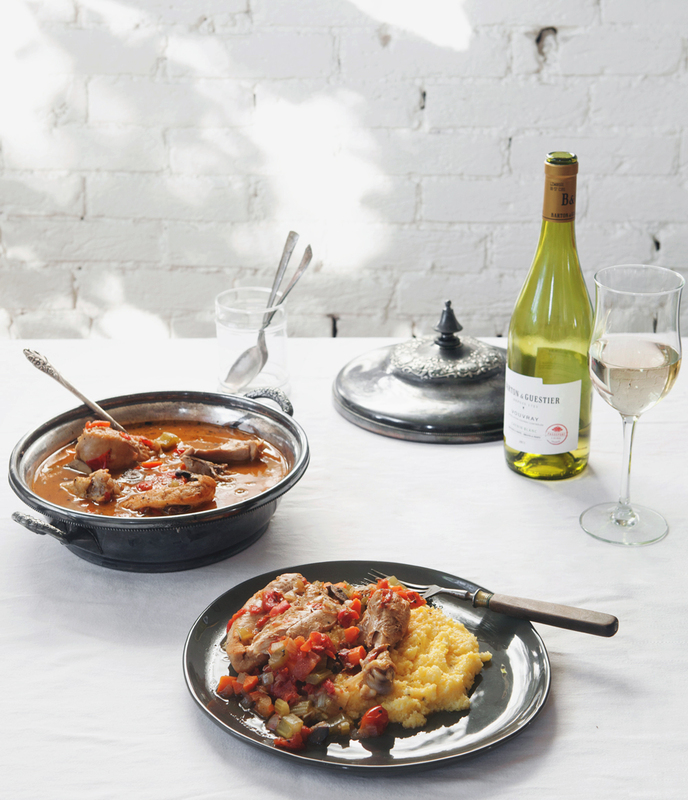 To serve, top polenta with chicken and sauce.